So I invited those wonderful boys to the farm. who allows us to post our favorite highlights. 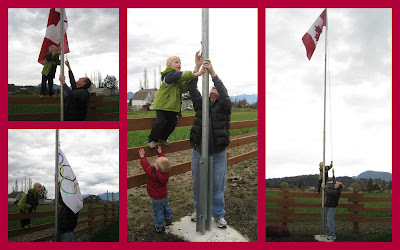 as we hoisted our Canadian flag, once again. Even the little guy wanted to help. 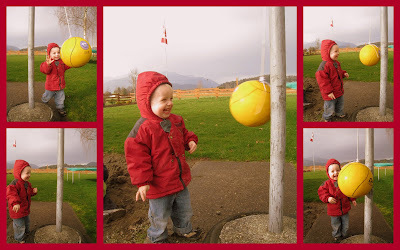 This little guy had so much fun playing tether ball by himself. as the ball continued to hit him smack in the face. and obviously enjoying the collapse. and of course we were chasing the pot of Gold. from catching up to the pot of Gold!!! I guess Canada received enough Gold this past week. Oh, to enjoy some of the flowers we planted last fall. which included up to 7 hour line-ups. About now, I am ready to zip to another country. Hope you all enjoyed your week! What sweet and beautiful photos from around your haven. Those boys look so content to be there! Great photos and good memories! Zip lines look like fun.. I'm afraid of heights so a zipline is not for me! I hope you had fun, though. Love the pics of your grandboys. Aren't towers supposed to be made for knocking down? What country are you going to??? 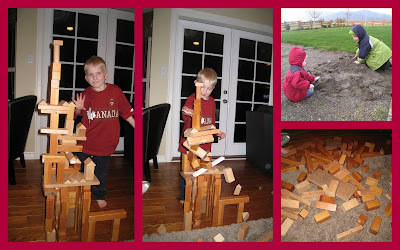 Beautiful photos and fun times with your grandsons. 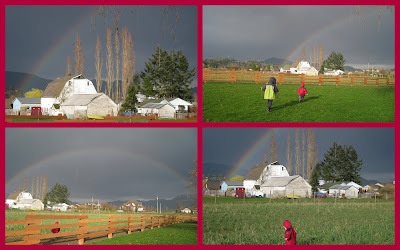 I think your landscape looks a lot like Southern Idaho/Northern Utah where I grew up, including the big barns! What can we do to replace the Olympics? I think a trip is a good solution! Oh Marg...how can I gently tell those around here who are still going about their days in Canadian hockey jerseys that time HAS moved on, and that Canada's on to other things now? Canada IS on to other things now, right? Right??? Love zip lines, even if they are a bit tough on the inner leg parts on me at least. Where are you planning on gadding off to now? Russia might be interesting. Give them a tip or two on how it is done! Awww. It looks like you boys had a great time. I love the rainbow pics the best! They always have soooo much fun! I love hearing the stories! Your collages are great, Marg! love the red! Yes, the week seemed so quiet without the Olympics! I miss all the excitement! Looks like your planning some excitement of your own! Hold on tight to the zip line! Are you zipping down to California??? If you're going to England, drop down and pick me up! What sweet boys they are and they look like they're having the time of their lives! I would love to zip even to another city! LOL. I don't get away much. The boys are too cute. Now that I am a grammie myself I have a much better understanding of the love you hold in your heart for these boys. Grandchildren can make the grayest of days bright and cheerful. All is right in the world when I am with them. Enjoy ! Beautiful Five, once again! Where are you zipping off to? 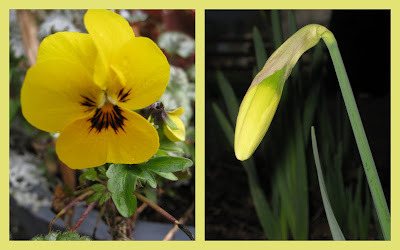 Friday's Favorite Five ~ March 19th!